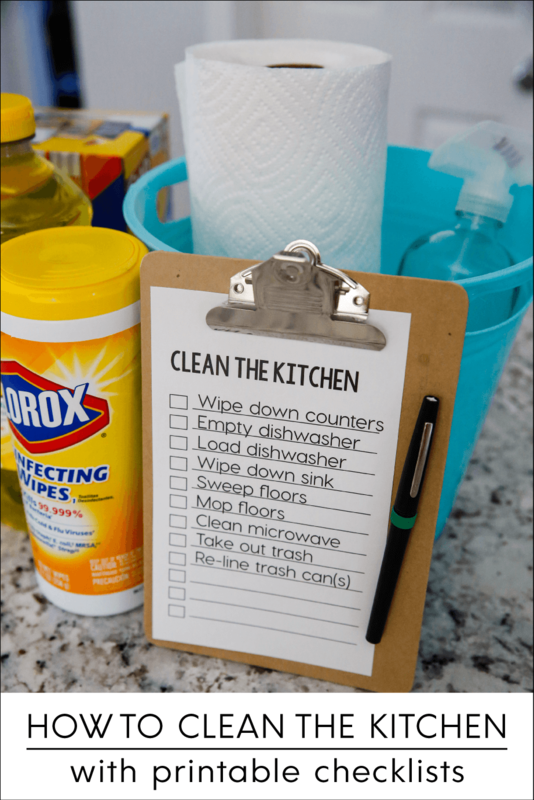 Let’s teach your kids how to clean the kitchen with these simple tips and printable checklists! We spend a lot of time in the kitchen. A LOT. The truth is, I would cook all day long if it meant I didn’t have to clean up. Cleaning up has always been my least favorite part. Over the last few years we have taught our kids how to do the dishes (better … because they knew how to do them, but didn’t do a great job originally) but it’s time to kick it into high gear and teach the basics of cleaning the whole kitchen. Not sure you are ready to pass the baton? You need to get your kids involved in cleaning! There are a lot of reasons for getting them to clean the kitchen, but my top reasons would be – they will always need this skill, they learn responsibility and that they can’t just make a mess and leave it, they are more apt to clean up after themselves if they know they will have to clean later anyways, and you shouldn’t have to do everything! Clorox Disinfecting wipes — they clean 99.99999% of bacteria (hello! ), can be used on all surfaces like stainless steel (we have a farmhouse stainless steel sink), hardwood, mirrors and glass. We use these everywhere – in the kitchen, bathrooms, even in our car. Glad Trash Bags with Antimicrobial Odor Protection– these are strong and protect from all the gross odors (which is huge for us!). Plus they grip our trash cans well. Pine Sol Lemon – I love the lemon scent! and it cuts through all the kitchen yuck, tough grease, grime, dirt, etc. Now it’s time to teach the kids what to do- gather all of your stuff and show them where it will be housed from here on out. They will then know where to go when it’s time to clean. You will want to take the time to go through all of the products so that they know what they are and how to properly use them. Using the checklist as a guideline makes that really easy to do. 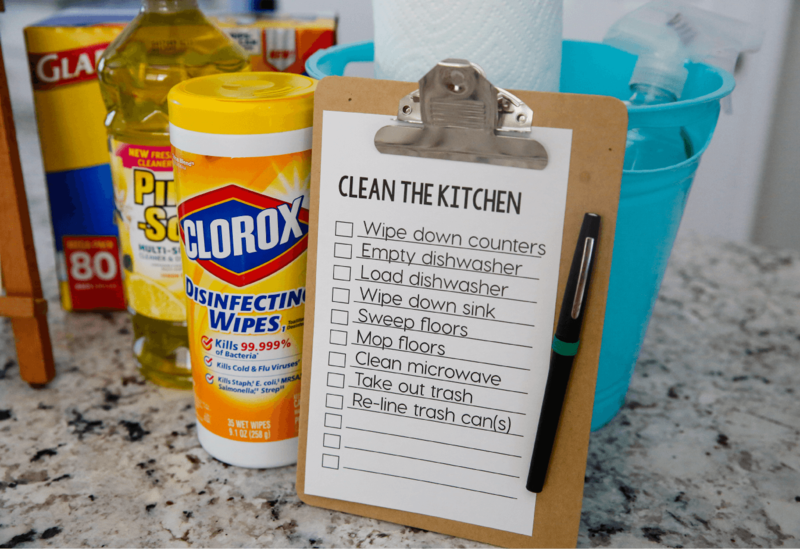 Wipe down the counters – Clorox disinfecting wipes make this super easy. Empty dishwasher – assuming that dishes have been done, they will need to first empty it out and put them away, properly. Load dishwasher- teach how to rinse the dishes off and put them in the dishwasher correctly. Wipe down sink – (we have had issues with this in the past) the job doesn’t stop when the dishes are loaded. There can be gross stuff left in the sink still. Make sure to show that the sink needs to be washed before moving on. Sweep floors – pretty self explanatory. Mop floors – show the ins and outs of mopping, using the right products, how to mop, etc. Clean microwave – if this is done every time, the microwave will be in tip top shape. I’ve included a blank checklist in case you have a different way of cleaning the kitchen or different needs for your kitchen. 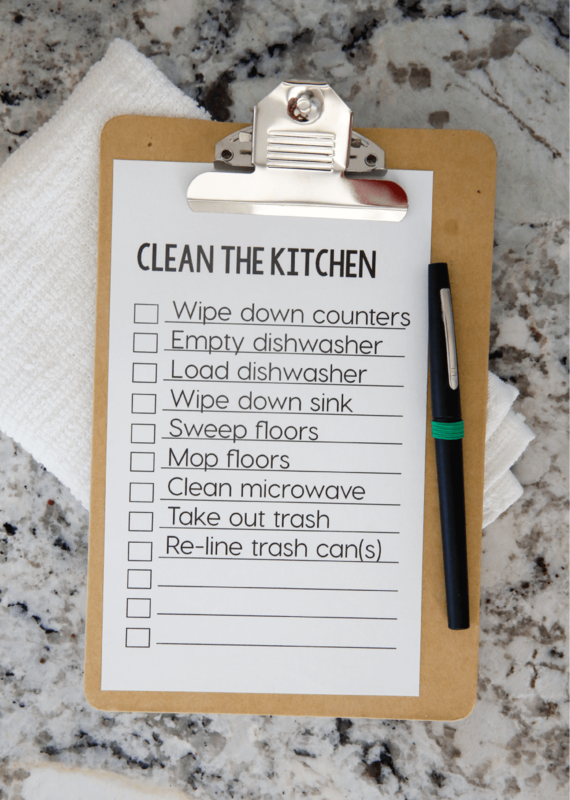 Download these “clean the kitchen” printable checklists. They most likely won’t get it right on the first time. Know that going in. Be ok with it. It takes practice – just like it did for you to learn. But keep at it. It is so good for them to learn this skill and will help you as well. You can feel free to use a laminator for these checklists. It’s my favorite thing to do with checklists. It makes so that it can be used over and over again. All you have to do is get a dry erase marker and you are all set.